Levoit are well known for making well-built air purifiers with great designs. Specializing in all things to do with indoor air tech, Levoit are fast becoming known as one of the leading manufacturers in the field right now. 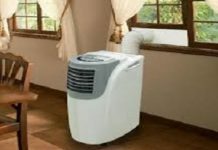 By simply doing a quick google search, you can find hundreds of favorable reviews of levoit air purifiers all touting the benefits of the various models in their range. The Levoit h132 is one of the smallest they make, designed to be used in small rooms, but also portable – so you can move it from room to room when the need arises. These mini models save on space and money, but still come equipped with genuine HEPA filters and smart features, whilst also offering low power consumption, less noise and odor removing technology. There are many benefits to the LV-H132 that for our money, makes it the best air purifier under $100 right now. As mentioned earlier, part of the reason Levoit are receiving so many plaudits right now, is due to their innovative and modern designs. The sleek minimalist look of the H132 is very futuristic and a far cry from some of the older and boxier designs from some of the older manufacturers in the business. The cylindrical shape with the fan on top conjures up images of airplane turbines. Measuring just 9.7in x 9.8in x 14.6 in, it’s no wonder it weighs only 6.6 lbs. This, of course, makes it a fully portable machine and covers very less space wherever it goes. Levoit supports a unique smart touch feature, so does not spoil the futuristic look by employing physical buttons. The LCD screen is situated on the top of the unit and displays four circles to notify power on/off, light on/off, filter reset and fan speed indicators. The top lid is removable, and so replacement of filters can be done as and when required with ease. The Levoit LV-H132 comes with a large pre-filter to protect the two inner filters that do most of the hard work. 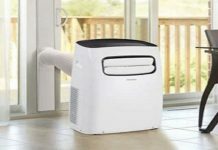 The genuine HEPA targets all the minuscule particles, such as dust mites, pollen and other airborne allergens and the Carbon filter is capable of removing even the most stubborn of odors. The Levoit h132 has a nightlight mode which illuminates a soft blue light from the top which is great if you’re using the device in a child’s room, as it can double up as a night light. Otherwise, you can just use it to increase that futuristic vibe. With 28 watt usage, Levoit makes sure that it does not use much power while working efficiently. It is energy star certified. You can adjust the speed of fan manually as and when required. Also, the fan is nearly silent! Levoit, although they provide robust air purifiers, they still provide a 2-year warranty on all their units. This includes replacement filters and defective parts. I would say the warranty is quite fair and easy to action should the need arise. It comes with a 30-day return policy which states that if you are not satisfied with the product, then you can request for a return and your money will be refunded. They also provide lifetime company support. Pre-filter: It is the very first layer of the filter, tasked with eliminating large sized particles such as pet dander and hair that otherwise might clog the HEPA filter. So if you remove these substances at the pre-filter stage, it will prolong the lifespan of the inner filters. The pre-filter is sadly not washable and the manual suggests you replace it together with other filters once every 6 to 9 months. HEPA filter: This is the workhorse of any purifier as it’s responsible for the majority of the work. 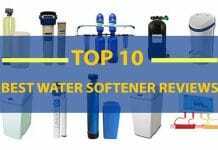 Capable of eliminating 99.97% of contaminants down to a tiny size of 0.3 microns or less. Carbon filter: The LV-H132 comes with an extra activated carbon filter which takes care of odors and improves the freshness of the air. Any type of odor, whether it be smoke, cooking odors, pet or diaper odors, this filter can deal with them all. Is it the best air purifier under $100? 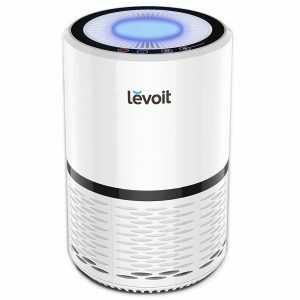 If you go through the list of air purifiers under $100, you’ll find there are many branded air purifiers competing against each other, out of which, I personally believe – the Levoit h132 wins hands down. While most of them which fall under this range have single button operation, this one provides many smart options to the users. Most air purifiers with this level of smart features, made by companies like Alen or Coway are priced at $200+ The design itself is enough to justify the price, but its stellar performance is the icing on the cake. With good suction, a genuine HEPA filter AND a carbon filter for odors, this little unit can do it all.